I am certainly no repointing or masonry expert, but after a bit of research and my own experience, I am sharing what I learned from the process. Repointing is the process of renewing the pointing, the external part of mortar joints in masonry construction. Over time, freezing and thawing cause cracks in the joints between bricks, allowing water to seep in. Before you begin a repointing project, it is very important to determine the type of mortar needed for your project. Typically homes built before 1920 used lime based mortar and homes built after 1920 used a cement based mortar. If your home uses lime mortar, you cannot use cement mortar…this can cause irreparable damage to a home. Lime mortars should be replaced with lime mortars and cement mortar with cement. If you are not sure what type of mortar you have, take a small sample of your mortar and have it analyzed. Water seeping into bricks can cause severe damage to a home, my advice is to repair the mortar in the early stages of cracking. I say that as a lesson learned from our front walkway project HERE, the mortar had become so badly damaged, the entire walkway was in need of repair. In our backyard, we have a very large retaining wall, separating the lower and upper level of the yard. Our yard allows us to walk out onto a flat surface from the main level and from the basement level. During our patio replacement project HERE, we repaired the crumbling mortar between the bricks on the surface of our retaining wall. 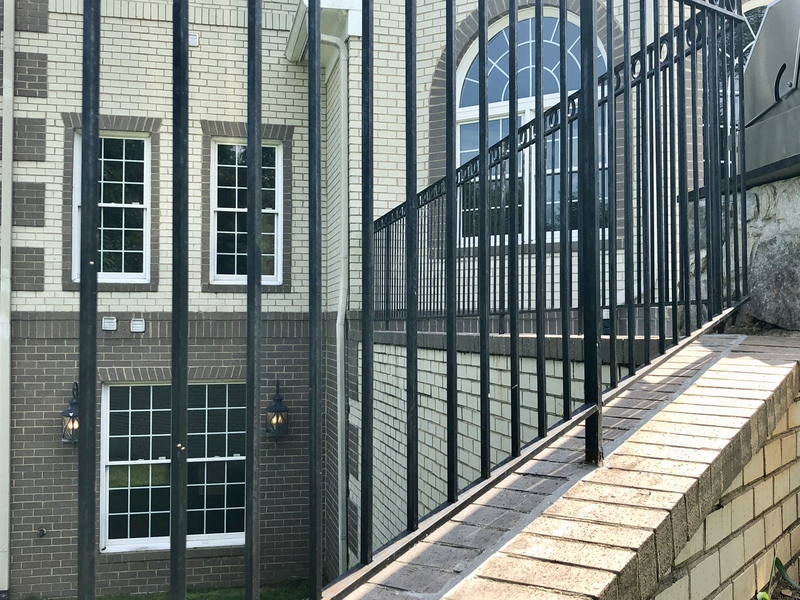 Due to the height of the retaining wall, a safety railing was placed on the surface but overtime, the mortar joints have disintegrated where the railing is held in place. The first step in repairing the joints, is to dig out the old mortar. This can be done with a hammer and chisel HERE and HERE or an electric tool can be used. Removing the old mortar takes time and patience. Once the old mortar is removed, a brush is used to clean the debris and remove any loose mortar left behind. Mortar will bond better to a clean surface. It is important to plan this job ahead of time, on a clear day without rain in the forecast. Repoint only when temperatures are between 40 and 90 degrees Fahrenheit. Cold makes mortar brittle, while heat dries it out and prevents hardening. A pointed trowel HERE is used to insert new cement in the joint, working the mortar into the crevice carefully. After the mortar has set, about one to three hours, a steel brush HERE is used to remove excess mortar from the surface of the brick, being careful not to touch the newly repointed joints. Approximately one week later, you can use a muriatic acid and water solution to wash over the face of the brick to remove any residual haze from the mortar. Inspect the brick often for signs of moisture, and remove any plant growth as close to the surface as possible. With proper maintenance, newly repointed mortar can last 25 – 50 years! Have you done any DIY repointing? Any tips you can offer? For more posts about outdoors and gardening, subscribe to Happy Haute Home and follow along on Pintrest HERE, and Twitter HERE and feel free to pin and tweet your favorite pics from Happy Haute Home.